LONDON, Feb 3 (Reuters Breakingviews) - Before the colonial era the Inupiaq people of Alaska, isolated from the rest of the world, lived off what they could extract from their harsh environment. They hunted seals and whales and used every part of the animal for food, clothing, heating, lighting and even building. Today, although many still hunt, the Inupiaq import food, fuel, building materials and other supplies to their villages. Their integration with the world economic system has brought material comfort at the price of reduced autonomy. In today's political debates, few contemplate withdrawing from the global economy to the extent of the traditional Inupiaq. In "The World After GDP", Lorenzo Fioramonti argues we should at least go some way in their direction. Fioramonti, a professor of political economy at the University of Pretoria - and author of a previous book on gross domestic product - believes that placing too much importance on raw economic output causes wasteful exploitation of natural resources and undervalues voluntary contributions to society, such as parenting. If the world were not dominated by the countries with the biggest economies but ranked in a different way, he argues, we would have a complete change in attitude. For example, a G7 made up of countries ranked by the sustainable development would include Costa Rica, Colombia, Panama, Ireland, South Korea, Chile and New Zealand. Yet the idea that simply using a different benchmark would allow these countries to set global policy is fanciful. Fioramonti is right that GDP doesn't take account of externalities such as the environmental impact of production. He uses the example of the Pacific island of Nauru, which boasted the world's highest GDP per capita in the 1970s and mid-1980s thanks to the exploitation of its phosphate reserves. But when the mines became unusable the island was left ravaged and its government defaulted. Now it hosts a detention center for refugees headed to Australia. But the author is far too optimistic about the power of the so-called sharing economy to transform the world. Other than being internet-based, the likes of Uber and Airbnb are much like other capitalist enterprises. Moreover, they depend on people using their own cars and homes to deliver services, generally undercutting regulated taxi services and hotels. Fioramonti inexplicably includes Alphabet's Google and Facebook in the sharing economy, though these companies use the data their users voluntarily share to sell advertising. 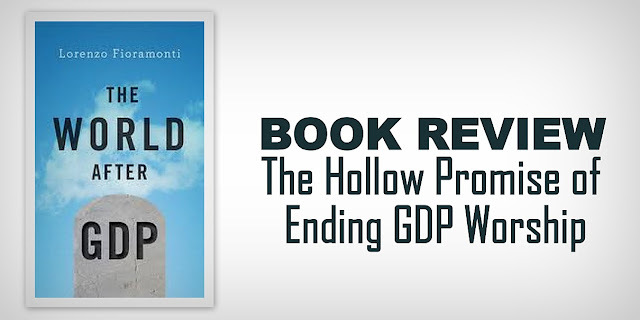 Fioramonti thinks the unacceptable costs of global trade will eventually bring about the failure of multinationals, ushering in a community-based lifestyle along the lines espoused by Mahatma Gandhi, the Indian independence leader whom the author calls "a champion of the post-GDP world". But he offers few ideas about how people in an alternative economy might pay for essentials such as food or housing. He suggests switching to alternative currencies, such as bitcoin, but doesn't explain how that will reward people for voluntary work. Fioramonti focuses on the idea of a sustainable village rather than on cities, which is where the majority of the world's population now lives. Urban dwellers cannot grow the food they need, so they have to import it. If villages do not produce a surplus, people will starve. Autocrats like Vladimir Lenin and Mao Zedong solved this problem by forcing small farmers to hand over their grain, with disastrous consequences. More prosaically, it's hard to see Western consumers voluntarily giving up, say, bananas, despite the environmental harm from transporting goods across the world. On a densely populated and highly connected planet, it's hard to imagine that supposedly self-contained communities will not intrude on one another, be interdependent, or come into conflict. Though we can benefit from looking at the world through a lens other than GDP, using a different yardstick for measurement will not change human behavior. CONTEXT NEWS - "The World After GDP: Politics, Business, and Society in the Post Growth Era", by Lorenzo Fioramonti, is published by Polity Press in February 2017. ISBN: 978-1-5095-1134-1.